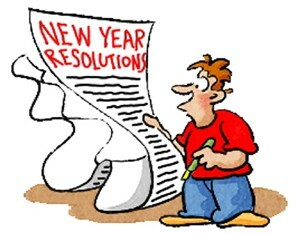 I don’t generally make New Year resolutions, and even if I do, I rarely tell people that I have made them. Why? Because I lack the determination and will power to follow through. So it’s easiest to just…NOT. But this year is different. This year screams for change. This year is mine. It belongs to me, @$%@ the rest of you. MINE. That said, I’ll share it with you if you keep me in check. New Resolution: No more clip art in 2014. Unless it’s those Bean guys. Those are classic. 1. Break my 20-year-old habit of cuticle picking. I stopped biting my nails in fifth grade and never looked back. I started chewing my cuticles in sixth grade and never looked back. It’s gross, I often do it to the point of bleeding, it’s a nervous yet calming habit, there’s even a photo of me doing it DURING our wedding ceremony. This is honestly probably the hardest to accomplish. TWENTY YEARS, PEOPLE. 3. Blog at least once a week. I was a huge slacker this year and have a draft pile bigger than the Christmas tree pile at the dump. While those trees and those drafts have now been outdated, I know you all pined for the words that I would not share with you (SEE WHAT I DID THERE OMG). Once a week, I should be able to handle that. Even if I have to make a meat mousse jello mold to share with you. 4. Climb mountains. My motto this year, as posted at midnight NYE, is “the year I climb mountains”. I don’t just want to be a “runner” again, I don’t just want to lose a few pounds, I don’t just want to be healthier. I want to climb mountains. Specifically a specific one, but that’s another story. It’s a big one. It’s going to require training. And cardio. And new shoes. And cardio. And sheer determination. I GOT THIS. I put it on Facebook. Thus, it shall be true. I’m not joking about the cuticles being the hardest. That mountain is going to be a piece of goddamn birthday cake in comparison. Alright, so now it’s your turn…any resolutions? Broken any already? I have. My thumb hurts. Resolution #1: Don’t eat the children.